Few days since updating again, I normally try to remain busy and at night continue to work as much as I possibly can. I don't think since we have been here that I have been to bed before 2 AM, because I am either always working or I just can't fall asleep. I won't go through each of the days to really update you all, but I will say that with each day that has gone by we can see Emily getting stronger and stronger,. Each day she is able to do more and more and we can see the strength in her getting more and more stronger and she amazes us to watch her and what she can handle. Transplant has been hard in many ways, being away from the family for so long. Monday will be 21 days and the girls haven't gotten to hang with each other in 2 weeks, not having home cooked meals and just being away from the family is the hardest part. Daddy only being able to see Emily for a little bit each day and the girls not all being together. Transplant was also hard because of the extremely high dose chemo and the side effects and then getting her stems cell back. While this was all hard, we know that this is something that Emily needs to have done to get better and we know that, but I tell you what... I so wish we didn't have to go through any of this, but we know it is the right thing and we know that Emily is going to make it through this. Doctor came in this morning and said that as long as nothing changes with Emily, such as no fevers or any other problems, that she would be able to go home tomorrow (Monday). He said it would probably be early afternoon, but she would need to go home on TPN, and some of her oral medicines and then of course have to be back in the clinic a couple of times a week. 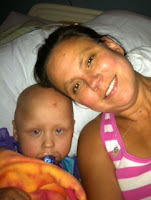 Emily's counts continue to go up, they were 2.7 tonight, but she still has some pain in the esophagus. Dr. Gowda indicated that this was normal and it normally takes the longest to go away.Emily really didn't get a lot of sores in her mouth, just a lot of redness, and then the esophagus was the worst which is taking the longest to go away. So, taking the oral meds makes this even harder on her, because it still hurts her going down. Was thankful the doctor gave us her prescriptions early so that I could go ahead and call CVS to get them together for us. Thank you Pharmacist Rick for taking care of these for us. It will take some time for Emily to continue to grow stronger at home, with her stomach, and eating and just those normal things that many of us take for granted that is so easy to do. We will be cycling (meaning the times of the TPN) the TPN so that Emily will get hungry.... Like the doctor said, since Emily hasn't eaten in so long, it is going to take a lot of time to get her back to where she was with eating and she will be eating very small portions at first and with that in mind her tastes will be very different than what they were before. We have been trying to get her to drink and eat a little bit, but like the nurses said with the TPN and fats that she is currently on, Emily won't feel hungry so eating or drinking while being on these 24/7 will make it harder for her to feel hungry so that is why they will cycle them. At night she continues to have low grade fevers, 99.5 to 99.9 and they tell us this is from the engrafting of the stem cells, still makes us nervous, for one if she gets a temperature of 100.4 while here, she won't be able to go home and if she gets the temperature of 100.4 while at home, she will have to come back to the peds floor, not the BMT floor. So, keep thinking of "NO FEVERS!" so Emily can have some time away before the next Stem Cell Transplant starts. I want to send out a lot of thanks to so many amazing family, friends and supporters for sending Emily packages, cards to fill her wall, and love that you all have left. Some of my friends, Melissa and Kira for stopping by to give me some adult interaction and for family, Nanny and Pop and Jessica for coming by to spend time with Emily. 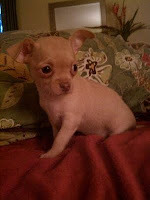 To my friend Amber and her husband Joe, who will make the girls day with a chihuahua puppy when we are ready to pick her up. (see picture onhttp://www.emilyhubbel.com) And moreso to my husband Doug for just being the amazing man that he is and doing all the running around and taking care of us and just being so special. Thanks Doug for bring the girls so that I can spend time with them, while you spend time with Emily and thank you to my girls, Jessie and Brianna for being special girls which I love so much and I am so sorry that we don't get so spend as much time together, but I love you girls so much. Doug is a very special man, husband, and father and I have to tell you all that I am really very blessed to have him in my life and the girls are very special to have him in their life. I know he can't wait for us to come home and we can't wait to come home. Sounds funny, but I am ready to return to work and come home and make dinner. Thank you to my work friends, my Dominion Family for being so amazing and checking on us and sending cards and being so wonderful and lastly, thank you Emily. Emily, you are my hero, you really are. Actually, Emily is our hero!!! 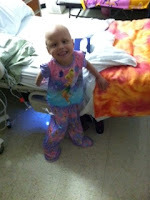 She is one amazing little girl, she really is. For all that she has gone through and still has to go through, she still continues to smile and try to make to us happy, she is still very thankful for everything and loving child and just one of the most caring kids you have ever met. She loves her sisters through and through, which is just amazing. Anyways, continue to send out lots of love and thoughts for Emily as she transitions home to clinic a couple times a week until the next time. We hope that Emily will be up to a camping weekend come soon but honestly all we care is to all be home together as a family! I don't even know where to start! What a beautiful family and what an amazing little girl. I'm sure emily's treatment is the same as oscar's. We are up to cycle 5 and have yet to do the transplant (nor do we know if he will have 1 or 2). Oscar has 2 brothers and misses them so much with all the time we spend in hospital. We wish Emily and all her family our best wishes and pray that the worst is over with. We will continue to follow your journey and share the highs and lows with you. So Happy to read this Shannon!!!! I can't wait for you to get that precious little girl back home!! Glad to hear everything is going well, i hope she gets to go home today. Still keeping all of you in my thoughts and prayers, and i'll pray extra hard that she keeps her fever down and doesn't have to go back to the hospital. Your new puppy is adorable, i have a long hair one he's not a great kids dog...i hope yours has a different temper! emily is an inspiration to us all!!! bless her great big heart!! You are all in our prayers, and we think of you often.